20% OFF CEDAR COLLECTION RANGE! 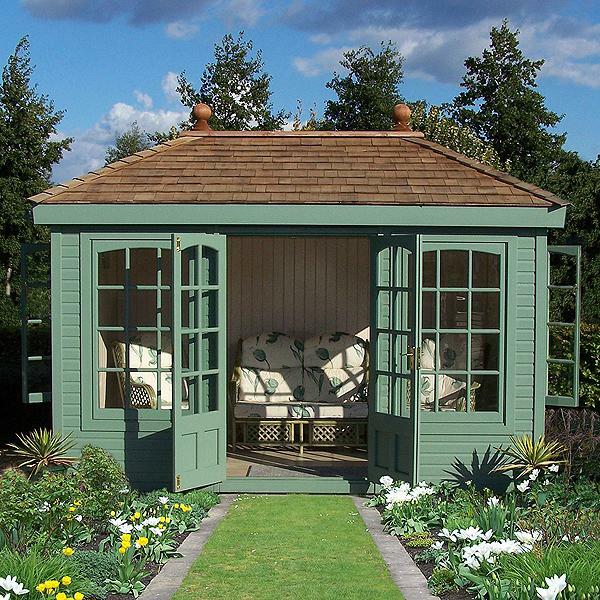 Influenced by the Malvern Ashton, the Milford summerhouse is a stunning addition to any garden. 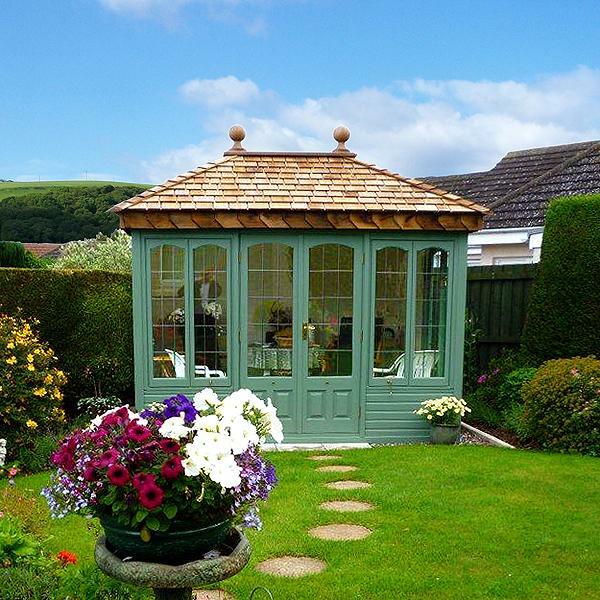 Handcrafted in Worcestershire, the Milford summerhouse is built with premium clear grade Western Red Cedar which is well known for its natural beauty, warmth, versatility and durability. 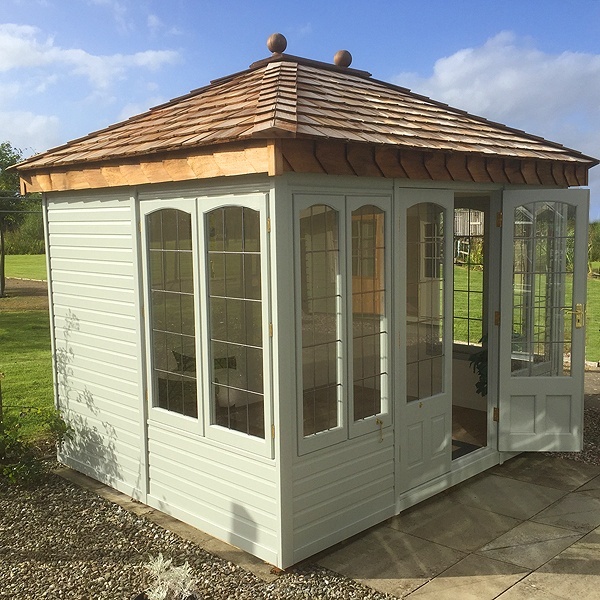 The Milford summerhouse is supplied with a spectacular Cedar shingle hipped roof, renowned for drawing the eye and bringing a lovely countryside feel to your garden. Available in a wide range of sizes, this pretty and versatile garden room can be used for many different activities - whether you want to entertain, wine and dine with your friends and family, or simply want a room to relax and unwind in, the Cedar Collection Milford summerhouse is perfect for you. The Milford, part of the Cedar Collection range also offers a choice of cladding profile. 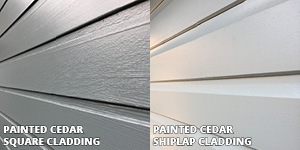 Choose from traditional shiplap, as featured prominently in the Malvern Cottage range, or square cladding - a contemporary and stylish cladding profile. Please take a look at our image gallery to see various sizes of this building along with pictures of its construction and optional items. Why Choose a Cedar Collection - Milford Summerhouse? The external walls, roof, windows and doors are all made from premium clear grade Western Red Cedar (Thuja Plicata). The beautiful and versatile Cedar produces its own natural oils and preservatives making it a durable and rot-resistant species of timber, perfect for a garden summerhouse. 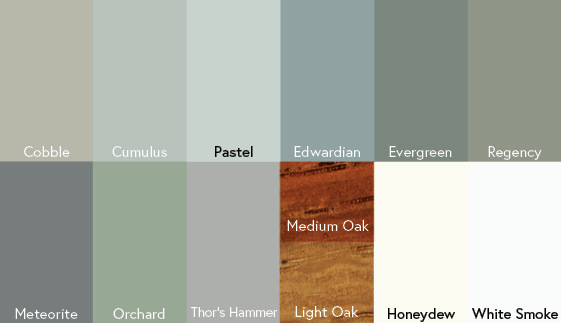 The Milford Cedar summerhouse includes a high quality painted finish and you can choose from 13 countryside colours! We can also paint the windows and doors in an alternative colour to really make the building your own. Just like the Malvern Ashton, the Milford Cedar summerhouse includes a pressure treated Western Red Cedar shingle roof which is both long-lasting and atheistically beautiful. All Cedar Collection range buildings are supplied with brass or chrome window and door furniture, bringing a high-quality finish to your summerhouse. A smart MDF internal lining makes the summerhouse feel more like an extension of your home and is supplied in a light and airy 'Honeydew' colour finish. Have peace of mind for the long term with a 10-year guarantee against rot and decay. 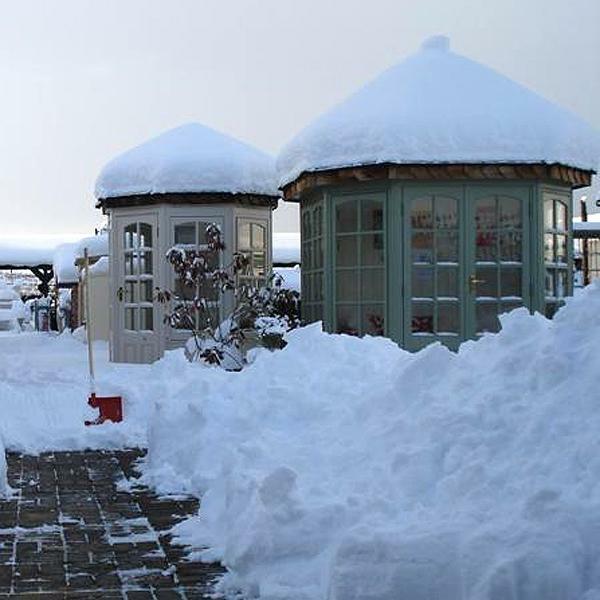 Keep your garden building warm in the winter and cool in the summer by adding U-foil insulation to the roof, floor and walls to provide insulation as well as a damp course membrane throughout. 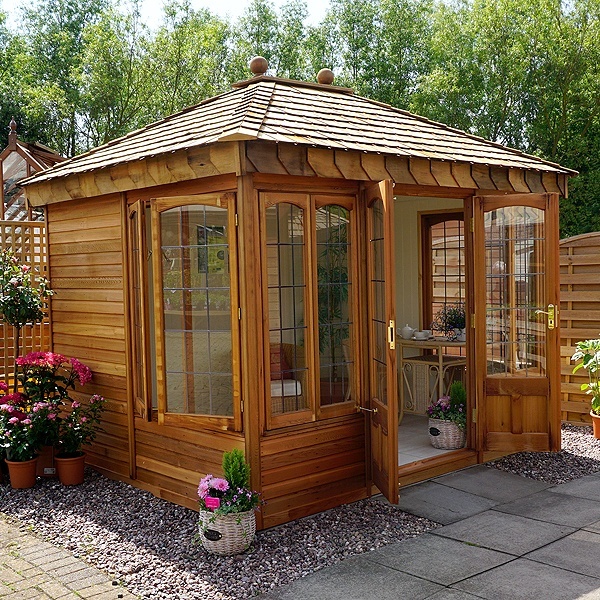 For the Cedar Collection Milford summerhouse, we have a great choice of sizes available - making sure we have the perfect building for your property! Change the look of your building by upgrading to either Georgian or leaded windows and doors. Add double glazing to your summerhouse where extra insulation is required to reduce heat loss. Please note singled glazed options have a curved top and double glazed have a straight top design. 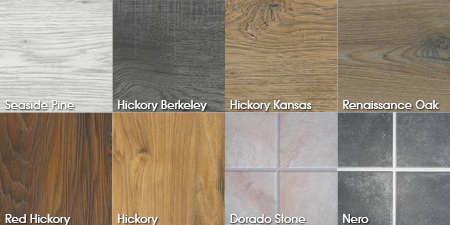 Decorate the floor of your summerhouse and with a choice of laminate floor styles. 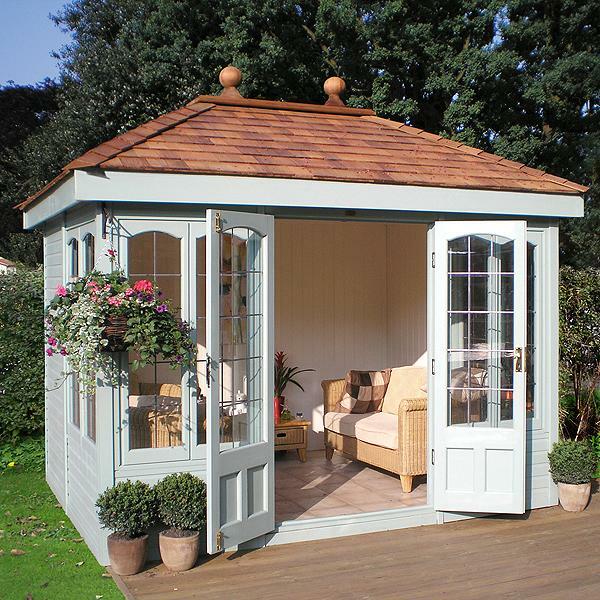 This Milford summerhouse is shown in Ice Blue paint finish externally. It is single glazed with toughened safety glass and has optional Square leaded windows and doors. Two opening windows at each end, four fixed windows in the front and double doors with solid brass door furniture are standard. A range of attractive laminate floors are available as an optional extra. 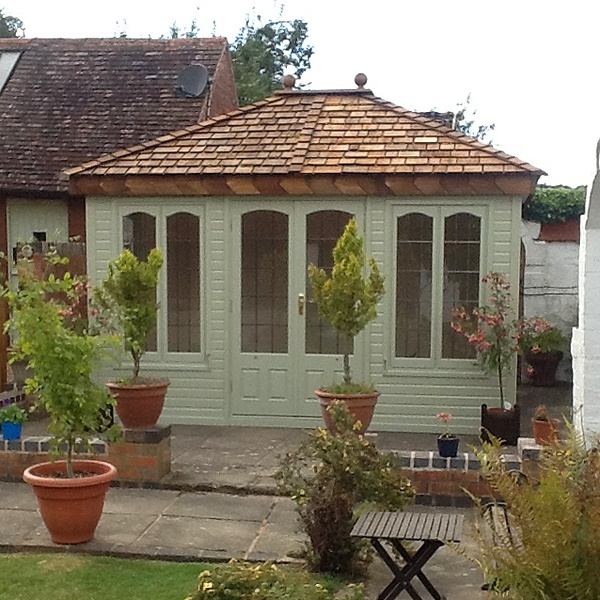 This Milford summerhouse is shown in Fern Green paint finish throughout. It is single glazed with toughened safety glass and has optional Georgian windows. Two opening windows at each end, two fixed windows in the front and double doors are standard. A range of attractive laminate floors are available as an optional extra. This Milford looks spectacular with a simple preservative treatment on the cedar external cladding. All Milford are constructed with cedar cladding but the timber is hidden by the attractive external paint finish as you will see from other pictures in this gallery. If you want to see the natural beauty of the cedar wood then we can construct it as shown, but remember, the cedar will gradually fade to a silver grey unless you maintain it annually with additional coats of preservative. This Milford was installed in the grounds of a converted farmhouse with beautiful views over the Bredon Hills. The Milford shown here is in Dove Grey with square leaded windows. You will see from other photos in this gallery that other styles of window are available, both single and double glazed. The 10 x 8 Milford is displayed at over twenty of our branches : here at Southport it features single glazed square leaded windows. Our branches are open 362 days a year so you can examine the quality of the buildings we offer. The Milford is available in a choice of colours, with single glazed or double glazed Georgian or Leaded windows, and with an attractive range of laminate flooring. The Milford is shown here with square leaded windows in a superb garden setting. What a lovely spot to stop and relax! This picture shows a 12 x 8 double glazed Milford in Moss Green with the roof shingles which are used on the eaves as well as the roof. They retain their colour for longer and need little or no maintenance. The coloured bargeboards pictured on many of the buildings on this page are still available if you prefer them but our display and production models have the eaves style demonstrated in this photograph. Please note the square topped windows which are a characteristic of double glazed models in the Milford range. Just to prove that these buildings are designed to deal with pretty much any weather conditions! These 'Linfords' bear the weight of an 18 inch snowfall at our Edinburgh site. There are four window options available : Plain, Diamond Lead, Square Lead or Georgian style. Single glazed windows have arched tops as photographed. These are the two options available for leaded windows. The window tops are square in shape unlike the arch topped single glazed windows. Georgian double glazed windows are also available which are square topped too. Double glazing and insulation are popular options with all models in the Cottage Range. Please note that the double glazed windows pictured have square tops unlike the arched top single glazed Georgian windows. This Milford Summerhouse has Georgian single glazed windows and doors. It is painted in Malvern Green with Honeydew windows. The two windows at each end both open. The tiled laminate floor is optional whereas the attractive cedar shingle roof and double front doors are standard features. Installation by the specialist fitters is all part of the package. All buildings in our Cedar Collection are glazed with toughened safety glass. NB. The Milford 8 x 8 roof now rises to a single point with one roof finial. This Milford summerhouse is on display at our Preston branch. 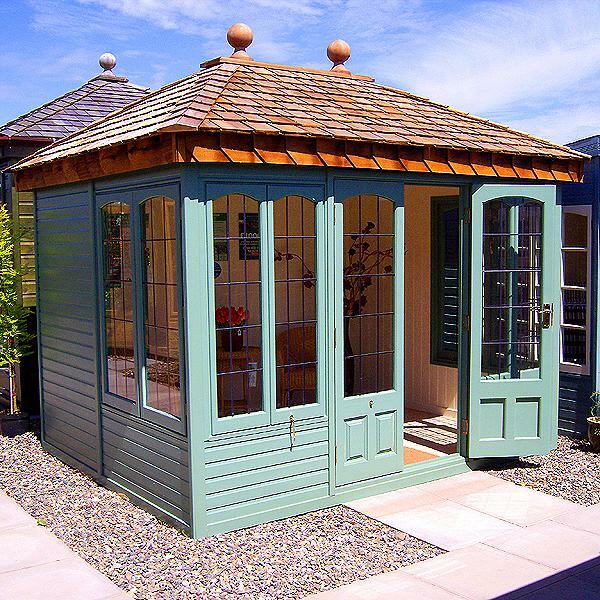 This Milford summerhouse is shown in Ice Blue paint finish with Honeydew windows, doors and interior. It is single glazed with toughened safety glass and has Georgian windows and doors. Two opening windows at each end, two fixed windows in the front and double doors with solid brass door furniture are standard. A range of attractive laminate floors are available as an optional extra. Pictured here is one of our wood effect laminate floors available for the Cedar Collection of summerhouses. We also have a comprehensive range of tiled laminate floor options. The chrome pack includes: Chrome handles, casement stays, hinges, hooks and eyes, and bolts. If you prefer, you can choose a chrome fittings pack with any of our Cedar Collection buildings rather than the brass fittings shown in most of these pictures. Pictured here is another of the range of superb laminate floors available for the Cedar Collection of summerhouses. We also have a range of tiled laminate floors available. All of our Malvern Cottage Summerhouses will be delivered and installed by our skilled team of fitters - ensuring that your summerhouse arrives in perfect condition and it is assembled to the highest standard. Please be aware that you will need to provide a good, strong and level base constructed from either slabs or concrete. This will need to be completed prior to our delivery date, ensuring that it is set and strong enough for the building to sit on. We will always confirm these details with you when you order and we will provide you with base plans (if required) so that no detail is left out. These measures ensure that your summerhouse will be both delivered and installed without any inconvenience. Where Can I See Malvern Cedar Collection Summerhouses?